If you came to this page directly, you might wish to read a page with an introduction to this section or page one and page two first. 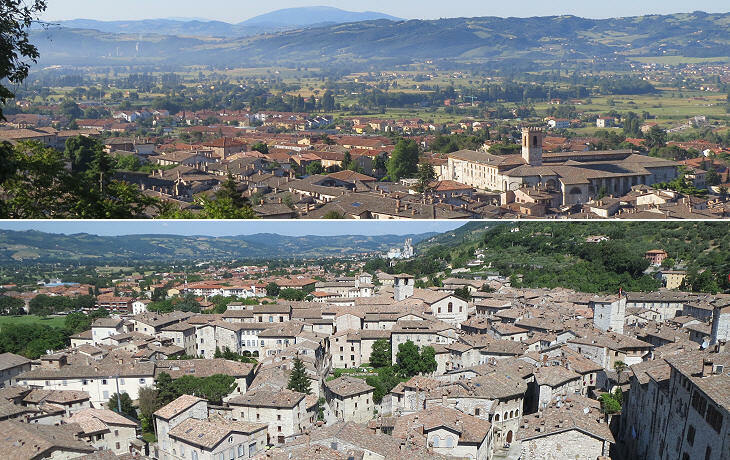 The position of the city of Gubbio is a rather remarkable one. Lying along at the foot of the main chain of the Apennines there is an entirely mountain-surrounded basin, some ten or twelve miles long by about two in width. It is not the valley, nor part of the valley of any river; and one does not see why there should be this flat and completely enclosed tract in the midst of the mountains. In all probability it is the site of a long since dried lake. The whole shape and formation of the country are such as to suggest this idea; and the flatness and fertility of this little oasis in the midst of the mountains would seem to confirm the theory. The decline of the medieval Comune government system led to the rise of Signorie (Lordships), informal dynastic governments such as that of the Medici in Florence. This development occurred in the Papal State too, although the ultimate sovereignty of the Pope was not challenged. In 1384 Antonio da Montefeltro, who already ruled Urbino, was appointed papal vicar at Gubbio by Pope Boniface IX. 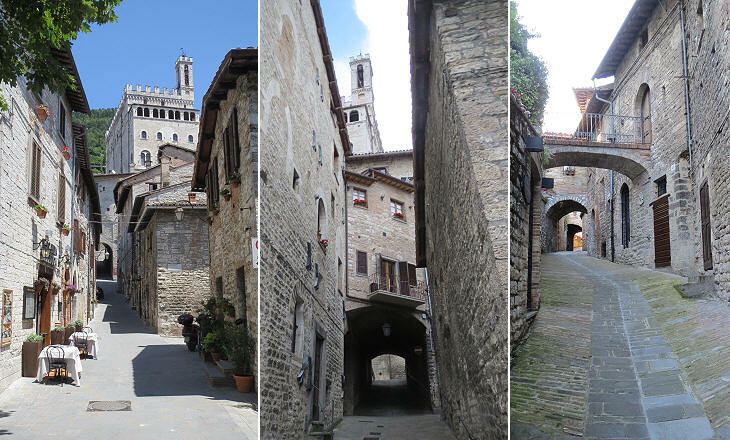 In 1443 the Montefeltro were nominated Dukes of Urbino (and Gubbio) by Pope Eugenius IV. In 1508 the last of the Montefeltro indicated Francesco Maria della Rovere, nephew of Pope Julius II, as his successor. Although the main residence of the dukes was at Urbino. they built a palace at Gubbio opposite the Cathedral. 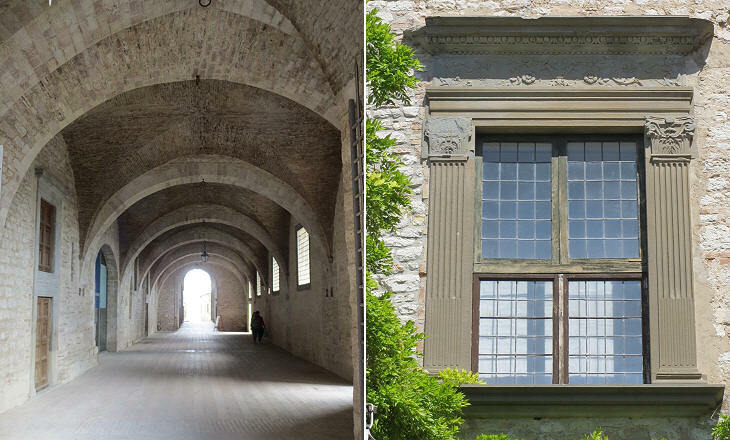 The palace was built in 1477-80 for Duke Federico da Montefeltro (who was born at Gubbio). The design of the building is attributed to Francesco di Giorgio Martini who was involved in the construction of Palazzo Ducale at Urbino. It stands on previous medieval structures which in turn rested on more ancient foundations. In 1624 Duke Francesco Maria II, who did not have male heirs, agreed to return his duchy to the direct rule of the papal government. The palace soon fell into abandonment and in the XIXth century it housed a wax factory. Four overtures were made to me by the proprietors for the sale of all the beautiful stone-work in the palace. And nothing save the difficulty and considerable cost of removal has prevented these exquisite specimens of the work of the fifteenth century from having passed into the hands of dealers, who would find a ready sale for them in Paris or London, could they be transported thither for any moderate sum. The intarsia work in wood, of the Duke Federigo's private cabinet, is in yet greater danger, in consequence of its greater transportability. Eventually the cabinet was acquired by the Metropolitan Museum of New York (it opens in another window). The image used as background for this page shows a coat of arms of the Montefeltro at Palazzo Ducale. 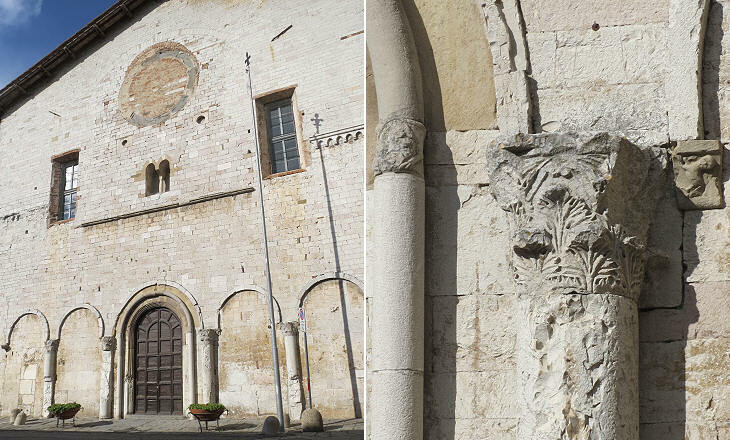 With a few exceptions such as Palazzo della Porta, Gubbio does not have any major palaces built in Renaissance or Baroque styles. 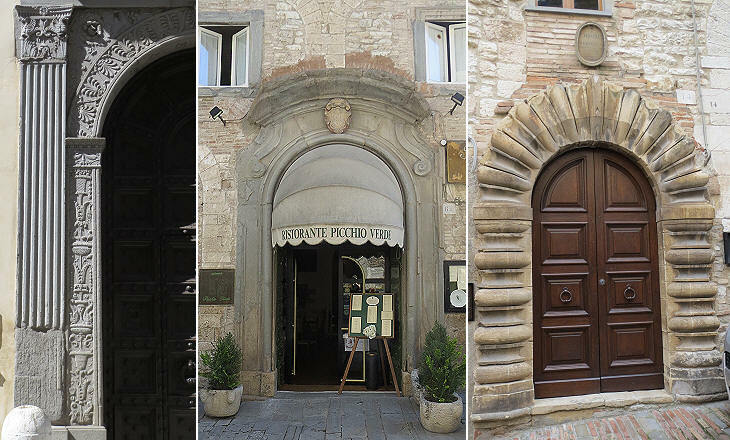 In many instances the wealthy families (of much impoverished Gubbio) limited themselves to adding a portal designed according to the fashion of the time to their medieval houses. Before the expansion of Gubbio along the slope of the hill in the XIIth century (see page one), the Cathedral of the town (Gubbio was a bishopric seat already in the IVth century) was located in its lower part and it was most likely replaced by S. Giovanni Battista which was built in the late XIIIth century. 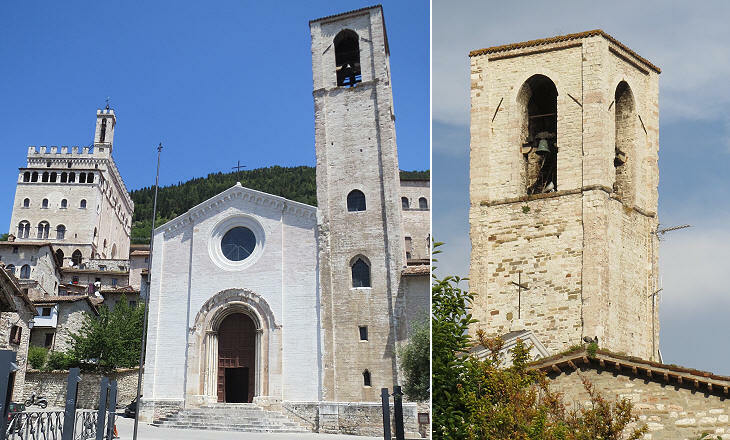 Its tall bell tower shows up in all panoramic views of Gubbio. The largest churches of Gubbio, apart from the Cathedral, were built by the great medieval religious orders which all had monasteries and nunneries in town. The Benedictine Order was housed in a very large complex. Its church was initially built incorporating a late Roman portico. 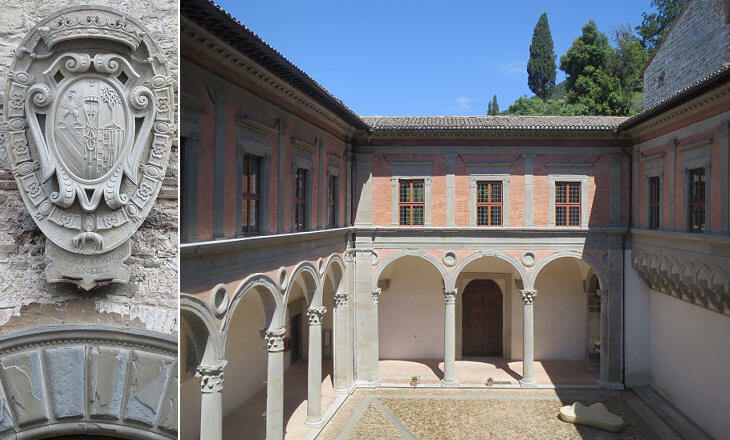 The façade was modified twice: in the XIIIth century and in the XVIth century when the monastery was acquired by the Olivetani, a branch of the Benedictine Order founded in the XIVth century. .
Today the Order of the Olivetani has a very small number of monasteries, but in the XVIth century it was a major branch of the Benedictine Order and a member of the Order became pope in 1590 (Pope Gregory XIV). The Olivetani cared for their churches and at Florence they commissioned Leonardo da Vinci with an Annunciation (it opens in another window) for their church of S. Bartolomeo (it is now at the Uffizi). Raffaellino del Garbo, a Florentine painter, worked for the Olivetani at the same church. 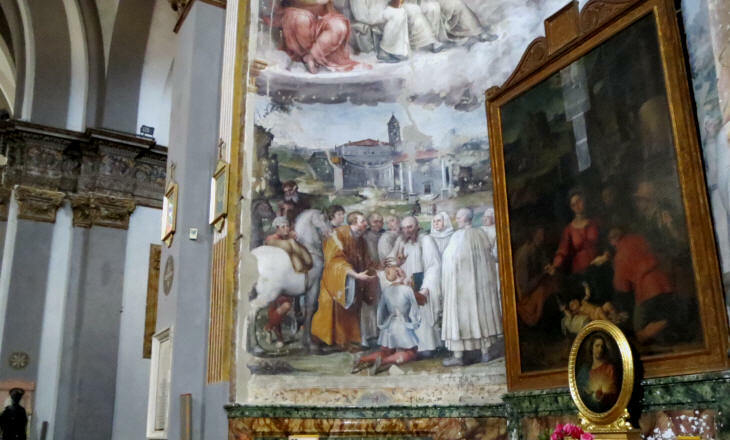 He was eventually sent to Gubbio to decorate S. Pietro. del Garbo (of the Good Manner) is an epithet he was given for the quiet elegance of his paintings. 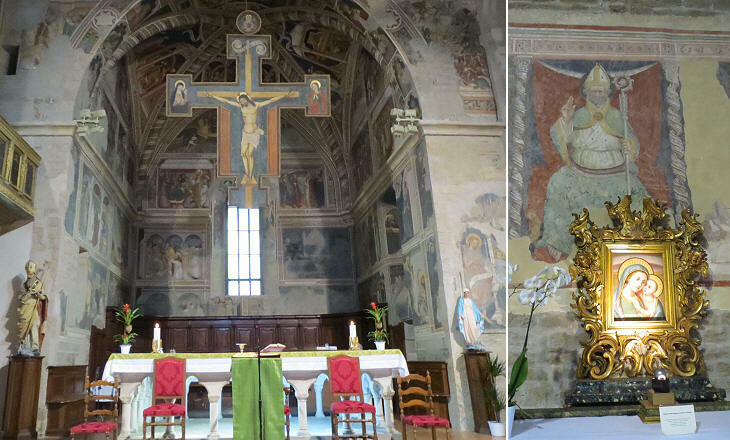 The walls of most churches of Gubbio dating XIVth/XVIth centuries were entirely decorated with frescoes. 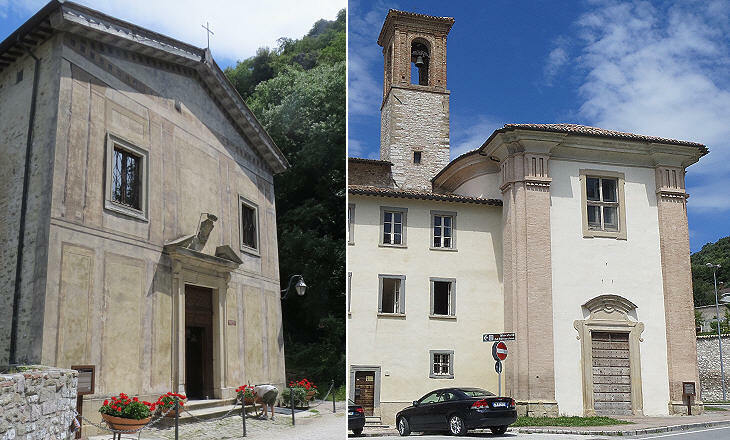 Some of them were covered with light plaster because they no longer met the taste of the time, others were damaged by damp, but many cycles of frescoes remain as at S. Agostino, the church adjoining a monastery of the Augustinian Order. 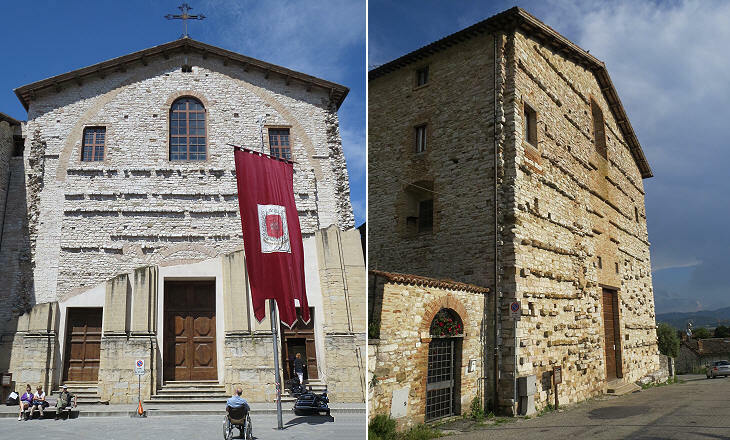 Almost all the Umbrian towns of some size have a Pinacoteca Civica o Diocesana (Civic or Diocesan Gallery of Paintings) to house frescoes and other works of art from deconsecrated churches. A sort of enmity/jealousy/competition led the main religious orders to build their monasteries at some distance from those of the other orders. At Gubbio, Franciscans, Benedictines, Augustinians and Dominicans had their monasteries in areas of the town far apart. The Dominicans never completed the large church they had projected and they eventually shortened the unfinished nave. They made an attempt to build a façade, but because of lack of resources they did not complete it (with an amazing result). S. Maria della Piaggiola is another church without a façade. But these churches are not an exception in Italy because in Florence both the façades of S. Maria del Fiore (the Cathedral) and of S. Croce were built in the late XIXth century and that of S. Lorenzo is still unfinished (you may wish to see the three of them - it opens in another window). S. Croce della Foce is a small church rebuilt in the XVIth century which stands outside Porta Metauro, the north-eastern gate of Gubbio. It still belongs to a brotherhood in charge of organizing the Good Friday procession. A large wooden statue of Jesus which is kept in this church is carried through the streets of Gubbio. You may wish to see some images of the procession - in Italian - it opens in another window. S. Secondo is another small church outside the walls. It is a very old church where St. Ubaldo, the XIIth century bishop and patron saint of Gubbio received his first religious education. In the XVIIIth century the exterior was modified in line with the fashion of the time. 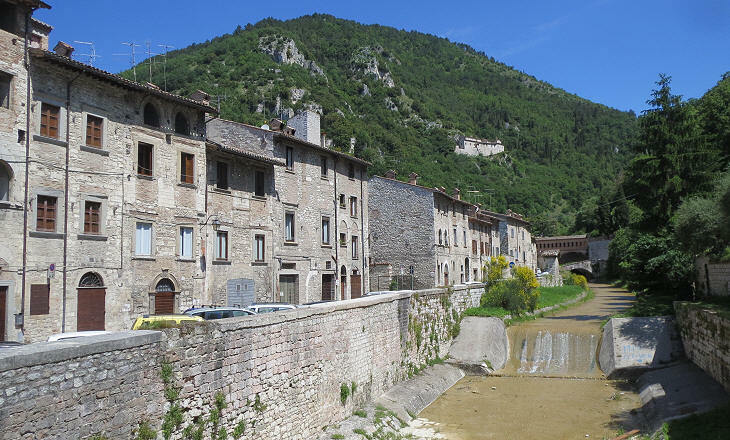 Gubbio is crossed by a small stream, which most likely in summer almost dries out. This explains why in the design of the town it was almost hidden with the exception of its upper section where it was utilized by some mills.